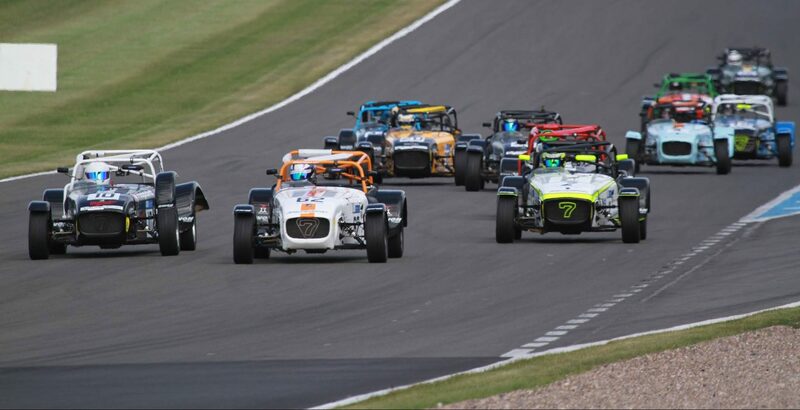 Ben Tucks campaign in the Caterham Supersport category continued after an exciting and successful GT Cup Silverstone debut at Donington Park last weekend. The weekend started off in Friday practice which was spent on fixing a handling issue that was discovered to be a failure of the brand new front suspension components fitted two races ago at Spa. This issue left no time to refine the car ready for qualifying. Ben’s team, PT Sports Cars, had also been working hard on his new engine to rectify its power problem after the last round at Brands Hatch. With power mostly restored to almost competitive levels and more new suspension components fitted, Ben took to the track in qualifying on Saturday. Immediately he took pole position in free air at lap record pace and stayed there for 15 minutes of the 20 minute session when another driver was able to take advantage of the ‘tow’ effect from other cars and took pole by 0.011 seconds minutes before the end. However, with a reasonable race car for the first time this season, the chances were good for a podium in Race 1. And so it proved, with 5 cars contesting for the lead, the ‘tow’ enabling drivers behind to easily catch the driver at the front, Ben swapped the lead on an almost corner by corner basis. But as the racing became ever fiercer, contact seemed inevitable, and two drivers touched in the penultimate corner of the lap in front of Ben, breaking the radiator of one of them. Spraying fluid onto the track in the final hairpin, just in front of the pit entry, the driver slowed and veered into the pits across the path of Ben, who was hit from behind and spun as he braked. The unpredictability of Caterham racing had once again struck and Ben was demoted to 9th. As he recovered, he set about catching the leading pack in the remaining 3 laps, posting the fastest lap of the race and the lap record. Just as the chequered flag fell, one of the leading pack took the fastest lap from Ben by 0.001 seconds. So the consolation prize of a third Caterham lap record was lost. Starting from 9th on the grid is no handicap for Ben. In familiar territory facing a comeback drive, Ben was optimistic and approached the race with business like determination. At the start Ben fired off the line and within half a lap was up to fifth and joined on to the now traditional 5 car scrap for the lead. With no one car being able to stretch away because of the ‘tow’ effect, the next 25 minutes featured ‘on the limit’ corner by corner battling, with the top 5 regularly swapping places several times per lap. The race was anyone’s and the Ben eventually missed out on the podium by just 3 tenths, taking the 4th place spot. 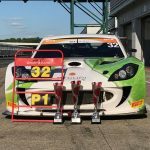 Remarking on his recent victory in GT which he hopes to return to later in the year, Ben said “Caterham racing is unusual really, it’s all about racing close and scrapping with cars all around. GT’s reward precise, accurate and smooth driving. The better you are, the better you do in the same machinery”. Ben next races at Oulton Park on 12th of August.